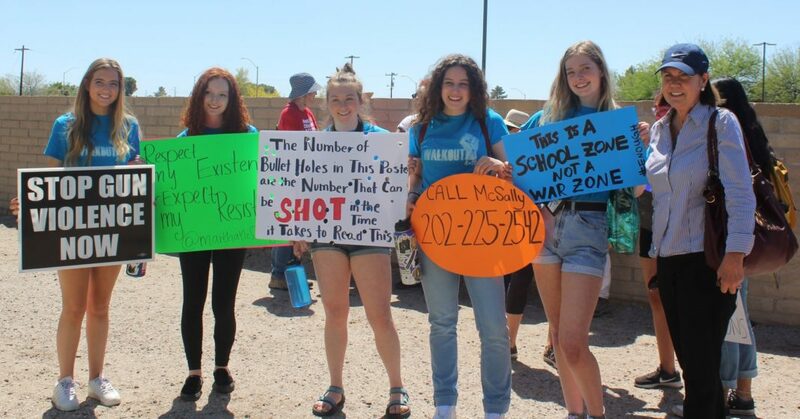 On the anniversary of the Columbine school shooting, Kirkpatrick (at right) joined students across the country in walking out to protest lax gun laws. She was invited by the students of Rincon & University High Schools to be a part of their protest. She was just named a Moms Demand Action for Gun Sense in America Candidate. The group pressures lawmakers to improve gun laws, raises awareness about gun violence and educates the public about common-sense gun laws and responsible gun ownership. She is endorsed by the Brady Campaign to Prevent Gun Violence. It announced the goal to cut the number of U.S. gun deaths in half by 2025 through background checks that are applied to all gun sales; to “Stop ‘Bad Apple’ Gun Dealers” – the 5 percent of gun dealers that supply 90 percent of all crime guns; and to change social norms around the real dangers of guns. She’s endorsed by the Giffords Law Center to Prevent Gun Violence. Founded by shooting survivor and former Congressman Gabby Giffords, the center’s legal experts research, write, and defend the laws, policies, and programs proven to save lives from gun violence. Democrats Matt Heinz and Mary Matiella are also Moms Demand Action for Gun Sense candidates. 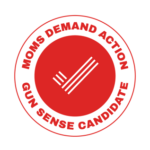 All seven of the Democratic primary candidates support gun safety measures. But Kirkpatrick stands out because she is a convert, making her more persuasive. Several years ago she supported the NRA, but not anymore. When the facts change, intelligent people change their minds, and she has. 89% say that laws covering gun sales should be made stronger. 87% say that preventing the sale of guns to domestic abusers is an excellent or good idea. 86% say that requiring background checks for all gun sales is an excellent or good idea. 77% see gun violence prevention as an important issue for Congress to focus on. Kirkpatrick is has a broad base of supporters. Of the $1.2 million she has raised in donations, $1 million were in small donations (median $10) made by individuals. On Facebook, she has 47,365 followers – more than 10 times more than the other Democratic rivals. On Twitter, she has 8,152 followers, second only to Billy Kovacs, who has 9,199 followers. She has strong Tucson roots, including a son who is a physicist at Raytheon and a daughter who is a resident at University Medical Center. Kirkpatrick attended the UA where she got a B.A. and a law degree. She taught at John Spring Junior High School on E 2nd Street and clerked for Pima County Attorney Barbara LaWall and US District Chief Judge John M. Roll. He was killed on Jan. 8, 2011 at the same event where Giffords was shot. Kirkpatrick became a Deputy Pima County Attorney for four years, prosecuting drug crimes. In 2004, she was elected to the first of two terms in the Arizona state House. In 2008, she was elected to Congress. She was re-elected in 2012 and 2014, representing a district that ran from Marana and Oro Valley all the way to Flagstaff and the Navajo Nation. According to Kirkpatrick, President Trump “wants the CD2 race to be all about him.” Trump is deeply unpopular and his support has torpedoed the elections of Republican candidates in Alabama, Pennsylvania, and other states. “We really hope he comes to Tucson,” Kirkpatrick said. 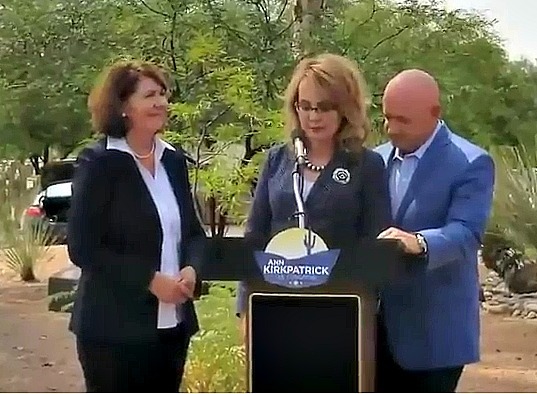 I believe that the gun control groups (and especially Gabby Giffords) would not support/endorse Kirkpatrick without Kirkpatrick having convinced them that she will follow thru on at least some of the widely-approved-per-the-polls gun control measures. And Kirkpatrick’s scores from the 2 pro-gun-rights groups did start going down after 2012/2013. HOWEVER, unlike almost all of the other Democratic candidates, Kirkpatrick has not made herself available for at-length Q&A at numerous public events, e.g. LD meetings and somehow could not find a free night in May or most of June to face questions from the local Democratic activists at a forum (including the her evolution re gun control when she was so passionately/verbally pro-NRA previously). This does not build trust. This reasonably leads one to believe she is avoiding hard questions. When she couldn’t do the forum, she could have set up a town hall for early July as an alternative. This makes me wonder if we are having the same problem with her that we’ve had with McSally re inaccessibility and non-forthrightness re issue positions. I’m in between a progressive and a moderate. Given the huge diversity of issues and perspectives, I feel I’m fortunate if I can have a Congressperson whose views coincide with mine 65-75 percent of the time. But I sure as hell want to know what I’m voting for. U.S. Sen. John McCain defeated U.S. Rep. Ann Kirkpatrick in her own congressional district last month on his way to winning a sixth term by a 13-percentage-point margin. I am deeply suspicious of candidates who defended gun rights so fervently and now have flipped. What facts have changed in the last 5 years? Any candidate who shows a conversion from pro-NRA to pro-gun-safety should be required to answer a simple question. Why were you pro-gun/pro-NRA in the first place? Liza got it right in her first “leopardess” reply. I couldn’t agree more. If the issue were different, if it were LGBT rights and marriage, we would have heard from the candidate herself the conversion story by now. I have friends who were affected by what happened in Orlando, and I, for one, am pretty tired of lawmakers getting such easy passes on this issue. Will she truly be an advocate? My question would be what exactly at that point in time were your intentions being pro-NRA, and what made you change your mind? One must assume she knew perfectly well the power of the NRA and what they do with it, and that she knew perfectly well what was already happening in our schools when she advocated as a member of congress for that organization. It just appears so irresponsible. I think in many ways she is a strong candidate, but here there is silence when there shouldn’t be. Larry, would you please ask the Kirkpatrick team for details on the CD2 forum that Arizona Daily Star political writer Joe Ferguson mentions today on his twitter feed. One of his followers asks for details. That is followed by a tweet from Ann Kirkpatrick’s campaign manager Emily Harris. She doesn’t provide a link, but writes: “The PCs at The Fountains at La Cholla are hosting this forum. This Friday, May 18th, 3PM.” This forum is not on the Blog for Arizona calendar or on the Pima County Democratic Party calendar. Where has the forum been publicized? Who is invited? Seems secretive. Larry, which candidates were invited to this Friday’s forum and which will appear? Who are the PCs that are hosting? I assume that Ann Kirkpatrick will be there, since Emily Harris is aware of it. What will the format be? Will the candidates take questions from the audience? Who will the moderator be? This is the first we’ve heard of it. We’re checking it out and will post the info. I checked and the CD2 candidates have agreed to speak to the residents of an assisted care facility. Many of the residents are elderly, disability challenged, and memory challenged, and the meeting will be in their small lobby. Considering the circumstances, it makes sense that the public has not been invited (the last CD2 candidate forum had 300-400 people attending). However, I’ve made a request to attend as a reporter. Larry, you left the ranks of “reporter” with regard to this blog some months ago. You have become an advocate for Ann Kirkpatrick. Why not be honest about it? Joe Ferguson, the political writer for the Arizona Daily Star, is a reporter, and perhaps he will attend this forum. Reporters make a serious effort to be objective. Although you say that the public has not been invited, Ann Kirkpatrick’s campaign manager, Emily Harris, responded to a tweet on Joe Ferguson’s account, with the time and place of the forum. Why did she jump in with that information if it is a private event? You’d have to ask Emily Harris why she said what she said. I am a reporter but I come with a point of view. I’ve said openly that I’m an elected Democratic Precinct Committeeman and I bring that perspective to my work. Joe Ferguson is a great guy and we work together on stories. But he’s limited by the corporate owners of the paper. He can’t go underground to secret GOP meeting and report on them, but we do. The Blog for Arizona presents “Politics from a liberal viewpoint” and we cover all the stories that the papers don’t write about. But if you don’t want to read what bloggers say, then you should read the Daily Star instead and listen to TV news. I have a journalism degree and don’t need a tutorial in newspaper ownership. You may have been a journalist in another life. Now you are a blogger and an advocate. And you don’t dispute that you are an advocate for Ann Kirkpatrick. I’ve been reading this blog for years, and don’t recall other bloggers calling themselves reporters. This may surprise you, but some people are wondering if you are working for the Kirkpatrick campaign or the DCCC. So THIS is the LEOPARDESS who changed her spots? No, Annie Oakley Fitzpatrick election-morphing into a “gun control” supporter is not “more persuasive” unless you are a toe-the-line Democrat. Actually, it is the disingenuous position of an opportunist trying to get elected by a constituency that is farther left on this issue than the one where she was previously elected. Period. Ann, of course, has attempted to explain her sudden epiphany with the most OFFENSIVE excuse ever put forth, that she changed her position when people she knew (at the Tucson massacre) became victims of gun violence. Do you even have a clue how offensive that is, Mr. Bodine? And all of you other die hard Democrats who think this is reasonable and the rest of us should just accept it and vote for her? Perhaps the Moms Demand Action for Gun Sense in America is wrong. Maybe the Brady Campaign to Prevent Gun Violence doesn’t know what it’s doing. Possibly the Giffords Law Center to Prevent Gun Violence is wrong. Perhaps the leading gun safety organizations in the country are wrong, and you’re right about Kirkpatrick. Why does this make her stand out? Plenty of massive shootings had happened when Kirkpatrick got her A rating from the NRA. Why don’t you report it correctly? How does that make this intelligent? This might as well be an extension of the Kirpatrick twitter page. You just have a higher word count. Interesting. Over the last year, I’ve written upbeat profiles about Billy Kovacs, Bruce Wheeler, Mary Matiella, Barbara Sherry, Matt Heinz and mentioned Yahya Yuksel too. But only when I profile Ann Kirkpatrick is it called a PR piece. This tells me there is nothing wrong with my writing, it’s your hostile perspective. I’m not hostile towards you, Larry. I just think it’s beyond upbeat to call a candidate who received an A rating from the NRA after several mass shootings had occurred as just a sign of some kind of gradual intelligence and now “stand[ing] out” as the “Gun Control Candidate”. Those kinds of statements sound like PR and they’re just, well, a little much to take in. If you write pieces like this where there’s no real critical thought on a matter as serious as this, you have to expect some criticism of the way in which you are using your public platform. Kirkpatrick’s record is documented, it is factual. If these organizations hope that she will represent them if elected, that’s fine. It’s not a matter of right and wrong. But voters have the right to review her record (on this and other issues, BTW), listen to what she has said AND make their own judgement. I realize that is a difficult concept for a toe-the-line Democrat, but it is what it is. I’m not going to stop thinking about the candidates because the DCCC etc…has made their choice. Ann Kirkpatrick has been an elected representative since 2004 (minus a few years), so one would expect her to have a large following on Facebook. By comparison, Martha McSally has 39K and Kyrsten Sinema has almost 50K. Example. Here’s what Ann posted on FB on May 10, her most recent post. This post received 28 reactions and three comments. One might conclude that her 47K following was not exactly fired up. Ann Kirkpatrick is in Tucson, Arizona. The only thing better than Target… Tucson’s SUPER TARGET! I came in for cleaning supplies and of course, leaving with much more! What’s in your red cart #AZ02? OMG. She posted the same thing on Twitter for one negative reply, one retweet, and 27 likes. Someone needs to do an intervention and tell Ann that this is not the time to be cute and social media is not the place to do it if you are a serious political candidate. But I can vouch that Ann is killing it in email. Does anyone read those? Mine are always in the spam folder. No, Mr. Bodine, that is Ann Kirkpatrick PANDERING to the NRA. Now Ann Kirkpatrick is PANDERING to the Democratic voters in CD2 who she believes might prevail in November. Why is it “old news?” Because of the dates? What is difficult to discern from these politicians who conveniently perform these switcheroos is what they truly believe and what they will actually do once elected. If you want to believe that Ann Kirkpatrick’s change of heart on gun violence is the result of a spiritual awakening brought on by her personal relationships with a couple of victims in 2011, then feel free to delude yourself. But trying to pass this off as reality to the rest of us is offensive at the very least. Equally as offensive as her saying it, which she has. And leave it at that. Stop pretending we are idiots. One more thing, Mr. Bodine. What facts changed, Mr. Bodine? Please be specific. What facts changed between the time Ann Kirkpatrick got her A rating and then later her D rating from the NRA? The devastating consequences of gun violence were unimaginable to Ann Kirkpatrick until it happened to people she knew. God help us, this is so offensive. She (Ann Kirkpatrick) traces the shift in her thinking to the 2011 shooting that left Giffords severely injured and took the life of John Roll, a federal judge whom Kirkpatrick once clerked for, and the 2012 shooting in Newtown, Connecticut. Here’s what getting shot in the head looks like. I guess if you didn’t know him it didn’t matter, right? But many Americans didn’t see it that way, thankfully. This post should have had a warning. I damn near just puked up my coffee and cinnamon toast. I’ll be back later unless I get blacklisted. More guns still means more dead people now, just like it did back when. The NRA stopped supporting safe hunting and sport shooting and went full on 2A terrorist back in 1977. The DNC fails to learn the lesson of the 2010 midterms, running from progressive causes and Obama because of the racist Tea Party, and the lesson from Trumpsters, who got so fed up with Republican BS they voted to burn the whole thing down. There comes a time when Dems will ask themselves, why do I keep voting for these people, like Sinema, who votes with banksters and Wall Street against our best interests, or Kirkpatrick, who seems to “evolve” as needed. I’ll vote for any Dem that can beat an R, only because Arizona R’s are full on bat-crap-crazy, but I hate voting that way. It makes me feel bad about my vote, and I want to feel good about voting in an American election. If the DNC doesn’t stop being corporate owned someday we’re going to have to burn it down. I just haven’t seen any evidence that the Democratic leadership cares how we feel when we have to vote for their chosen candidate. That’s a huge part of the problem. Sinema did vote against the Republican rollback of Dodd-Frank (Financial Choice Act). Wow, Liza. You put up 15 comments from 7:48 am to 12:56 pm. Rather than ranting for hours on end, perhaps you should open up your mind and do some real research on Kirkpatrick’s positions. Her position on gun safety is identical to that of Matt Heinz. But perhaps you are working on the Heinz campaign and already know this. I did other things in between comments, Mr. Bodine. You might be amazed by the speed with which I can post. To be honest, I’ve been far more interested in a different story this morning. Which, as a matter of fact, might be a whole other issue we should be asking our Democratic candidates about. But I am compelled to say, Mr. Bodine, that your ability to miss and/or evade the point is remarkable. And no, as I’ve told you before I am not working on the Matt Heinz campaign.